Old Elthamians will be hoping to stay at the top of National One when they take on Chinnor in Round Eight. 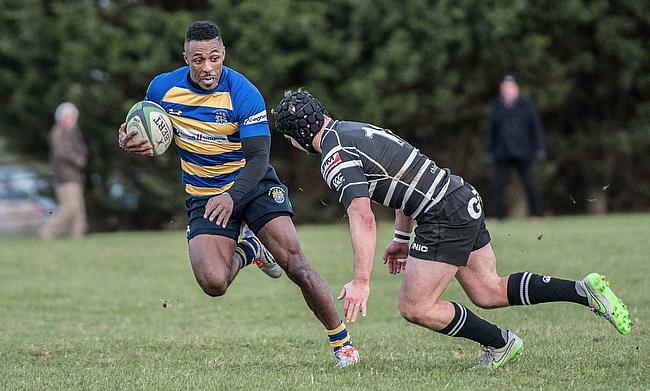 Last weekend, OEs moved to the summit of the third tier for the first time in the club’s history after beating Loughborough Students and this Saturday, they come up against a familiar foe in Chinnor. Both sides competed for promotion from National Two South in 2016/17 and while Chinnor failed to gain a place in National One on that occasion, Matt Williams’ side are now at this level and ready to challenge Old Elthamians once again. Second placed Caldy will have an eye on proceedings in Oxfordshire as they currently sit two points behind OEs ahead of their clash with Cambridge while Sale FC, who occupy third spot as things stand, welcome Rosslyn Park to Heywood Road. Elsewhere across National One this weekend, Blackheath host Birmingham Moseley, Rotherham Titans go to Esher and Cinderford travel to Ampthill and District. Also, Darlington Mowden Park take the trip to Loughborough Students while Plymouth Albion entertain Bishop’s Stortford. It has been quite the rise for Old Elthamians. Last Saturday, they moved to the top of National One after victory over Loughborough Students and this was just the latest chapter in their remarkable recent history. Director of Rugby Gavin Lach is now in his 10th season with the club and he has overseen their journey from Premier London and SE to the third tier. He has guided OEs to five promotion in eight years and now his side sit at the summit of National One heading into their latest battle with Chinnor. An eagerly anticipated return to old rivals @ChinnorRugby - kick-off 3pm. Like OEs, Chinnor have also been on quite a journey in recent years. In May, they confirmed their promotion to National One for the first time in the club’s history and similarly to Lach at OEs, Matt Williams has done a superb job at Chinnor. The Black and Whites and OEs last met in March 2017 as both sides were going for promotion from National Two South, but it was OEs who went on to secure second spot and a place in National One. However, the two old foes meet again this weekend and with fourth placed Chinnor only three points behind OEs, this latest encounter at Kingsey Road should be an intriguing contest. After defeat to Plymouth Albion in Round Six, Caldy made sure that it was just a blip in form as they got their excellent season back on track with a wonderful victory over Ampthill and District last weekend. Simon Verbickas’s men had to fight valiantly for their fifth win of the campaign and their latest triumph means the Wirral club head into Round Eight in second place and just two points behind Old Elthamians. Caldy are certainly turning heads as the unpredictable nature of National One continues and Cambridge will be hoping to get themselves back amongst the frontrunners after a defeat to Blackheath last time out. Richie Williams’ side are 11th in the table, but they are only six points behind Caldy going into this clash at Volac Park. The Blood and Sand have won just one of their first four matches at home this term, but a victory over an in-form Caldy side would be the perfect response after a disappointing loss in Round Seven. Sale FC are thoroughly enjoying their maiden season in National One. After storming to the National Two North title last term, Jonathan Keep’s side have not looked out of place in the third tier and their result in Round Seven emphasised that point. After trailing 27-10 to last year’s National One runner-up Darlington Mowden Park away from home, the Manchester-based club mounted a simply stunning comeback to secure their fourth win of the campaign which means they are now third in the league standings. After achieving their first ever victory away from home at this level, the men from Heywood Road are back on their own patch this weekend where they have been superb over the last year or so. Sale are currently on an 18-game winning run at home so Rosslyn Park will be aware of the challenge that awaits them when they arrive in the north-west. Park come into this fixture after snatching a late victory over Birmingham Moseley as Kieran Powers’ men returned to winning ways following successive defeats. Can Park now become the first side to beat Sale at Heywood Road for 17 months? Blackheath are going about their business very nicely at the moment. Four wins from their last five games has lifted ‘Club’ to fifth place in National One and James Shanahan’s side are only four points off league leaders Old Elthamians as they prepare to host Birmingham Moseley this weekend. The London-based outfit have had solid campaigns over the last two years, but they are showing all the signs of being able to mount a serious promotion challenge this term. Looking to halt their progress will be Birmingham Moseley who are desperate for a slice of Blackheath’s momentum. Winger Sam Pointon told Birmingham Live this week that he and his fellow teammates need to ‘have a hard look at themselves’ after slipping to a late defeat against Rosslyn Park last Saturday. Moseley currently occupy a spot in the bottom three and they are six points off safety as things stand so a win at Well Hall in Round Eight would be a much-needed boost for Richard Protherough’s side. It looks as though Rotherham Titans are clicking into gear in National One. After relegation from the Championship in April and major changes to squad personnel during the summer, the Yorkshire club suffered a slow start to life in the third tier following just one win from their first four games. However, Joe Barker’s side are starting to gel and three straight league wins has changed the complexion of their campaign as they come into Round Eight oozing confidence. Last week’s win over Chinnor lifted Rotherham to third place in the table, but they come up against an Esher side who will also be in a buoyant mood. Rickey Nebbett’s men may still sit in the relegation places, but they have won three of their last four matches to leave them just a point away from the safety positions at this early stage of the season. The Surrey-based outfit would have been delighted to clinch their maiden away win of the term against Bishop’s Stortford in Round Seven and back at Molesey Road, Esher will be keen to continue their positive recent form. Cinderford produced an excellent performance last Saturday as they defeated Plymouth Albion in tricky conditions at Dockham Road. Paul Morris’s side were promoted into National One back in April and they will be satisfied with how things are going in the third tier as we enter Round Eight this weekend. The Foresters sit in seventh place as things stand and they are only five points off league leaders Old Elthamians, which highlights just how tight this league already is. This Saturday, they travel to an Ampthill and District side who will be keen to keep up with the early pace setters especially after picking up just one win from their last four matches. The A’s lost to Caldy last time out and after finishing in the top four for the last three years, they would have been tipped for a promotion challenge this term. There is still plenty of time for Ampthill to get themselves back towards the top positions in the league and a win at Dillingham Park would be most welcome after a difficult month. Darlington Mowden Park were left shell-shocked last weekend. Danny Brown’s side held a 27-10 lead in the second half against Sale FC, but the north-east outfit saw their 17-point advantage disappear as they suffered an unlikely defeat at The Northern Echo Arena. Their result in Round Seven sums up a mixed start to the season for last year’s runners-up and they will be hoping to respond when they take on Loughborough Students. DMP will be heavy favourites when they arrive in the Midlands as Loughborough enter this contest on the back of seven straight defeats. Alan Buzza’s men are already 14 points from safety and as we have seen over the last couple of years, if teams get cut adrift early on, it is extremely difficult for them to avoid the drop. The Students have been in National One for the last eight seasons, but now their time at this level seems to be under threat. A first victory of the campaign is starting to become critical for the Students and they will be hoping success occurs this weekend. Plymouth Albion’s tough start to the season continued in Round Seven. After leading at half-time against Cinderford, Kieran Hallett’s side fell to their fourth defeat of the campaign and last year’s bronze medallists are finding it difficult to generate any momentum this term. Albion currently sit just two points clear of the relegation places which is not where many people expected Plymouth to be after such a strong season last year, but they will be keen to ignite their campaign once again when they welcome Bishop’s Stortford to Brickfields. Following three wins from four matches, Stortford would have been massively frustrated to lose to Esher last weekend and Andy Long’s side are now one place and one point behind Plymouth heading into Round Eight. Both teams could do with a win to spark their respective seasons into life, but who will come out on top on the south coast?